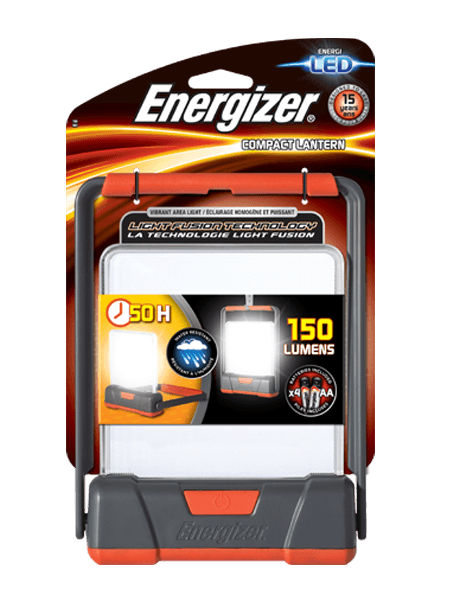 The Energizer® Compact Lantern with Light Fusion Technology delivers a powerful, portable area light solution. It generates an impressively bright, 360 degree radius of illumination through its unique Light Fusion Technology. The attached carry handle folds down for added stability or can be used upright to carry or hang the light as needed. Slim, lightweight, and water resistant, this light is perfect for outdoors, camping or even power outages. With an added power-saver setting, users can extend runtime greatly. The Energizer® Compact Lantern delivers bright uniform light and the flexibility users desire.